I read Across the Universe over a year ago and was satisfied with the ending, but when the sequel was available as an ebook through my library I decided to read it. I am so glad I did. If you haven't read the first book, you'll want to do that before you read this. It's been three months since Amy was unplugged and "accidentally" woken up from cryostasis. She's trying to adjust to life on Godspeed without her parents but it's difficult with Elder being so busy running the ship. The people have been taken off phydus which gives them more freedom but makes them harder to control. Elder has his hands full just trying to keep everybody alive and fed when he and Amy discover there are even more secrets aboard the ship. 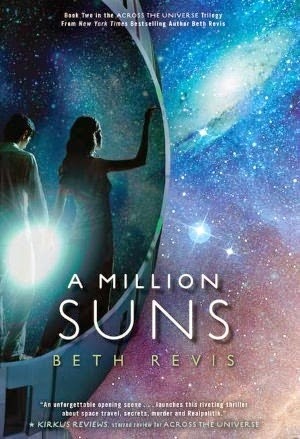 A Million Suns is just as exciting as Across the Universe. A good blend of science fiction and mystery, A Million Suns is a must read for fans of dystopian literature.